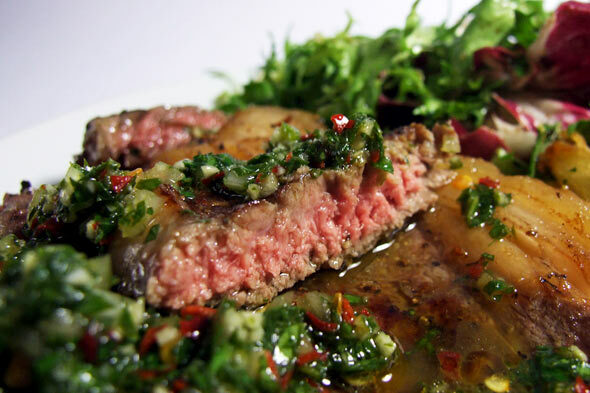 This is a great way to eat a steak in the summer – the flavours in the chimichurri sauce are fresh and vibrant, and it goes well with a salad on the side. The sirloin steaks can also be cooked on the BBQ, so it is a good option for dining al fresco. Place the shallots, chillies, garlic, paprika and parsley in the food processor and blitz until finely chopped. Add the juice from 2 lemons and the olive oil then blitz to mix until well combined but don’t over pulse. Season with salt and pepper then refrigerate for an hour minimum or better still overnight. When you’re ready to cook, bring the steaks to room temperature and rub generously with olive oil before seasoning with sea salt and black pepper. Place a dry frying pan over a high heat and leave it to get searingly hot. Place the steaks in the pan and cook them to your preference. Uma is a passionate chef with 20 years experience. She enjoys preparing a range of world cuisines and working with different herbs and spices. Uma is also particularly interested in healthy eating and the benefits of raw food and superfoods.